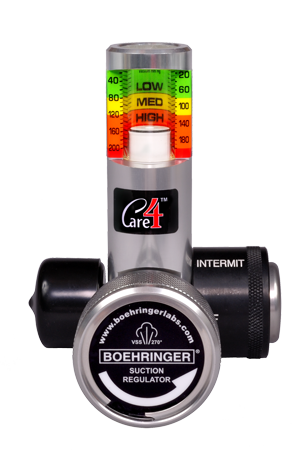 Care4™ is the world’s FIRST and ONLY four mode suction regulator. It defines the Standard of Care allowing you to use the same suction regulator throughout your hospital. Emergency Departments, Operating Rooms, Recovery Rooms, ICU’s, Step Down units and procedure areas can now have a single durable instrument for all of their clinical suction needs. excellent performance after every impact. Care4™ brings to you a single suction regulator that can safely manage ALL of your clinical suction needs. Before the introduction of Care4™ hospitals typically relied upon older three mode intermittent suction regulators to standardize their hospitals. Instead of having a dedicated FULL LINE vacuum mode, clinicians were encouraged to simply adjust the dial to potentially unsafe suction ranges. This practice could allow you to unknowingly expose your patients to high vacuum, or allow for indwelling catheters to be left for long periods at high vacuum. The design of the Care4™ maintains the intermittent and continuous modes to vacuum levels clinically appropriate for routine adult interventions, but if higher levels are needed for emergent or surgical needs the clinician can quickly select this level of vacuum. A safety interlock also prevents inadvertent application this level of high vacuum. Appropriate for hospital-wide use for suction therapy procedures needing continuous or intermittent suction including closed suction, deep suction and oral care. Also may be used in areas need high-flow, high-vacuum on demand. Areas of use include: Critical Care, Operating Room, Emergency Room, and Inpatient Acute Care; Extended Care and Skilled Nursing Facility Care; Surgery Centers and Ambulatory Care.